Box Text: Controlling a character to pop your opponentsâ€™ balloons before they pop yours sounds easy, doesnâ€™t it? Donâ€™t be fooled by this gameâ€™s simple premise or cute exterior, thoughâ€“underneath these youâ€™ll find a surprisingly addictive game with strategy to spare. After mastering the easy-to-learn controls, you still have to get a grip on the gameâ€™s impressively realistic physics. And if thatâ€™s not enough, there are still the ever-increasing enemies and environmental hazards like lightning and water. Or try the gameâ€™s second mode, Balloon Trip, if you feel like taking a break from the action and just want to see how long you can stay aloft. And hey, who doesnâ€™t like popping balloons sometimes? 01-08-2013 desocietas Box Text Controlling a character to pop your opponentsâ€™ balloons before they pop yours sounds easy, doesnâ€™t it? Donâ€™t be fooled by this gameâ€™s simple premise or cute exterior, thoughâ€“underneath these youâ€™ll find a surprisingly addictive game with strategy to spare. After mastering the easy-to-learn controls, you still have to get a grip on the gameâ€™s impressively realistic physics. And if thatâ€™s not enough, there are still the ever-increasing enemies and environmental hazards like lightning and water. Or try the gameâ€™s second mode, Balloon Trip, if you feel like taking a break from the action and just want to see how long you can stay aloft. And hey, who doesnâ€™t like popping balloons sometimes? 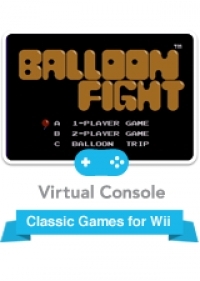 This is a list of VGCollect users who have Balloon Fight in their Collection. This is a list of VGCollect users who have Balloon Fight in their Sell List. This is a list of VGCollect users who have Balloon Fight in their Wish List.